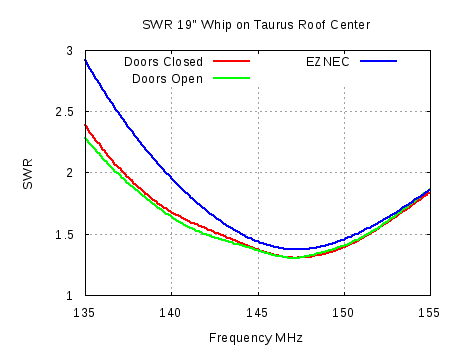 In the competition for the most boring blog post of all time I present you with Return Loss and SWR data taken of my roof top 2m whip mounted on an NMO through-hole mount. The car is my daily driver 1998 Taurus sedan. Along with Return Loss and SWR, I have the data from an EZNEC simulation for comparison. You can check out the Taurus install in a previous post. To make this a little more interesting, I made measurements with the doors closed and open to see any effects. While very slight, there was a noticeable effect from the doors. 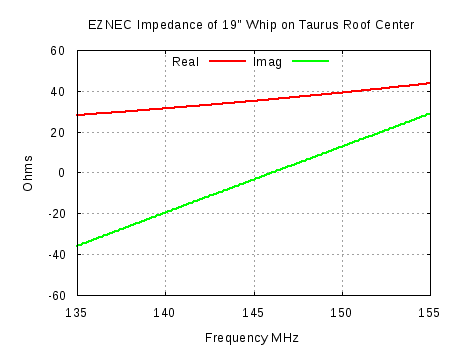 As you can tell, the whip simulates and measures slightly higher than the Amateur Radio 2m band. However, this basic simple antenna is so broadband, this is not an issue here. The point where the antenna resonates is clearly seen where the imaginary part of the resistance crosses zero ohms. At this point the real resistance is well below 40 ohms. This is no surprise right? A monopole over a reasonably good ground should be about 30 – 40 ohms. This is, of course, not a perfect match to our 50 ohm cable systems, but is plenty good enough. 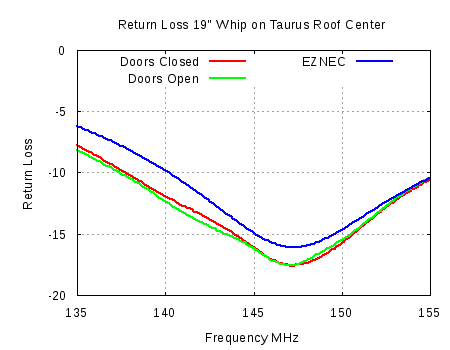 Adding cable losses helps hide the antenna’s real impedance values. My cable is about 12 feet of LMR-195. Without resorting to more calculations of how cable losses affect measurements, it is enough to say the cable helps hide mismatches… even if only slightly. There are likely other mechanisms at play which will cause a difference between measurements and simulation. My simulation assumes an infinite ground plane, while the Taurus is certainly limited and more so as wave length increases. One can go too far thinking these things. That’s enough for now. So ends the most boring blog post of all time.